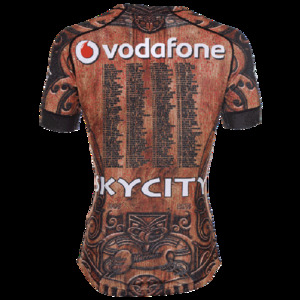 Like the ornately carved meeting houses of the Māori people, this year’s heritage jersey “Te Whare Tu Toa” is similarly carved. 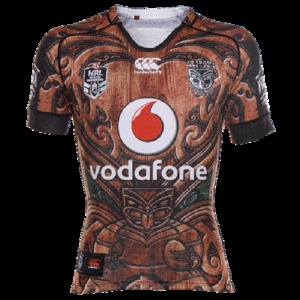 The jersey design depicts the history and stories of the Warriors team. The teams past and future are carved into the back and front of the jersey with the player inside providing the link to the present. When players wear the 2015 heritage jersey “Te Whare Tu Toa” they carry with them onto the field the rich history of the Warriors club - effectively players are entering the House of the Warriors. The Canterbury of New Zealand produced 2015 Heritage Jersey celebrates the 20 year history of the club. The concept of the jersey is carved out of native timbers and features all of the players who have ever played for the clubs first grade team emblazoned onto the back of the jersey. On the front is a carved warrior representing the future and on the lower back the carved warrior represents the first team to take the field for the club. Above the players’ names is another carved warrior logo and the 3 of them together represent paying respect to the past, present and future of the club. Recognising all those who have come before and welcoming all those who may one day wear the jersey. 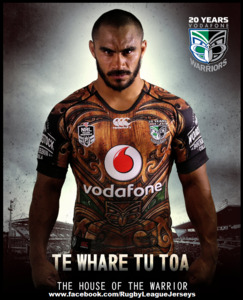 Also behind the main warrior on the front is another warrior logo - this one pays respect to the Warriors whanau (or family) this represents the players families, wives, children, mothers, fathers, brothers, sisters, grandparents, cousins, it also represents the fans, sponsors and administrators of the club. This logo sits in behind the main warrior and breathes life into the main figure. Without all of the support from everyone mentioned the Warriors cannot exist. So it is about paying respect to all who follow and are involved in the club in every capacity. There are many symbols carved into the jersey. The mangopare (hammerhead shark) features heavily and this is a warrior like symbol. It captures the essence of the Maori proverb 'Kia mate ururoa, Kei mate wheke', i.e. to be like the shark not the octopus which surrenders at the first sign of difficulty or resistance. It symbolises facing the challenges with diligence, tenacity and determination. It represents never backing down - no matter how big the fight. The koru throughout the carving represents growth, life, reaching upward toward the light and nurturing. All important things in a warriors life. The koru also represents movement and the free flowing style of league that the team endeavours to play. The wood represents hardness and strength and also is symbolic of creating something special from the block of wood. The player is shaped by the coaches, team mates, the club and those around him … just like a carver would create a beautiful carving from a block of wood. This also represents the players own journey. 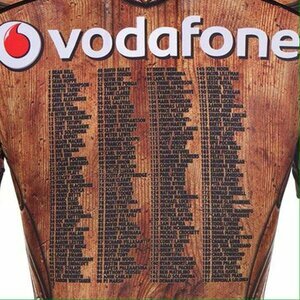 Back features a full list of every NRL player from the first 20 years. Pique mesh fabric to wick away sweat and keep you dry and comfortable. Reinforced seams with contrast tape for additional strength. 20 Years Vodafone Warriors logo on the left chest in recognition of our anniversary. Made from 100% polyester sublimate pique mesh 245gsm. Player issue/match worn jerseys were essentially the same jersey as the retail version except for the tighter player fit, GPS pocket and white number on the back.